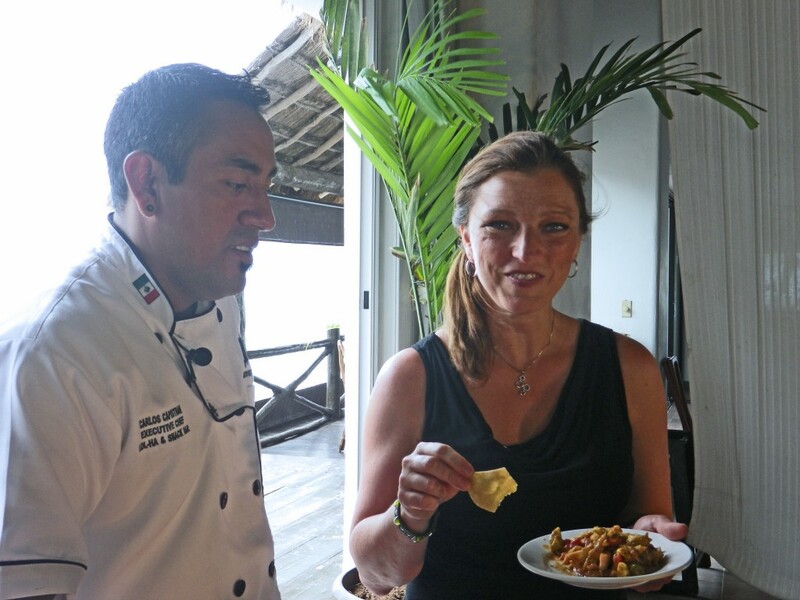 Several seasons ago I filmed regional cooking in Akumal, Mexico at the Lol-Ha Restaurant. I learned how to cook amazing meals and appetizers for under $10 or $15 per meal using fresh vegetables, such as this amazing Shrimp Veracruz Cocktail. Cooking on a beach with a chef who loves garden fresh food – what an experience! Follow the video above to see how it is made. In a large bowl mix the ketchup, tomato juice, lemon juice, and tomato puree. Add the diced tomatoes, red onions, and cilantro. Let rest for at least one hour. Add shrimp and the rest of ingredients to the bowl. Mix well. Looks lovely when served in a cold martini glass with a few slices of avocado resting on top. Serve with the chips or crackers. *Note – Because the FTC requires it, I am noting that the Mayan Riviera Tourism, Hotel Akumal Caribe, Villa Akumal, and Akumal Guide Mexicarte sponsored this experience. I was not told what to document or how to document the experience of making Shrimp Veracruz Cocktail, we were simply asked to attend and film – anything expressed in posts related to the activities is my own opinion expressed from my own personal experience.